If the glorious lineup for this year’s festival wasn’t enough, we’ve added the fantastic Earthling Society – one of the most ambitious and exploratory bands out there reaching for the limits of guitar noise, tracing a line from the krautrock of Ash Ra Tempel to the head-nodding hypnotism of Wooden Shjips. They’ve played with Julian Cope, Damo Suzuki, White Hills and Hawkwind and take elements of each of those acts, weaving in elements of raga and jazz to create something entirely their own. Their extraordinary version of Alice Coltrane’s classic ‘Journey in Satchindananda’ achieves lift-off to another planet entirely. We strongly recommend getting your ticket sooner rather than later as the show is proving very popular (of course!). Tickets are available from We Got Tickets. We’ve also put together a playlist for Q Magazine if you want to listen to some of the bands and get excited! 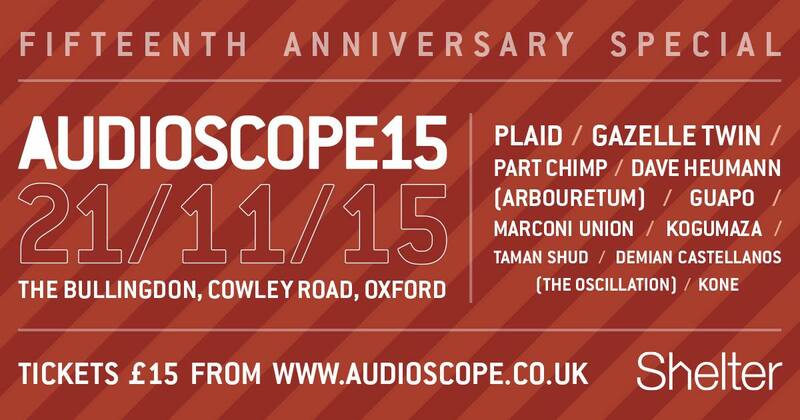 AUDIOSCOPE14 lineup announced – Public Service Broadcasting, Silver Apples and more! After months of working behind the scenes, the time has come to announce the lineup for the fourteenth Audioscope festival! We are very proud to have the amazing electro-archivists Public Service Broadcasting as headliners, following electronica legends Silver Apples, one of the most influential electronic artists of the past sixty years. But the surprises on this year’s bill don’t stop here. We will also have Wrangler, the exciting new band from members of Cabaret Voltaire, Benge and Tunng; breakbeats, noise and folk all in the same set from Third Eye Foundation’s Matt Elliott and experimental shoegazers The Telescopes (who played Audioscope 10 years ago and ended up drilling a guitar on stage!). There will also be cutting-edge electronica from Circle Traps, dark tales of Australian history from The Doomed Bird of Providence and extraordinary multi-layered vocal gymnastics from You Are Wolf. In addition, The Neon Violets and Kid Kin, two of Oxford’s most thrilling discoveries, will bring their lysergic psych-rock and crystalline electronics to the stage. The festival takes place at The Jericho in Oxford on Saturday 8 November. Tickets are available now for £15 in advance from www.wegottickets.com/audioscope and as usual, all profits go to support Shelter’s vital work and campaigning. With your help and support, we’ve raised more than £27,000 for Shelter so far. Since 2001 we’ve brought leftfield and alternative musical artists to Oxford – Four Tet, Wire, Explosions in the Sky, Damo Suzuki (Can), Clinic, Michael Rother (Neu! ), Grumbling Fur and Deerhoof are just some of of the names. We are very excited about this year’s lineup, and we hope you are too!